At Macias Eye Medical Centers we serve patients from San Bernardino, Riverside, Fontana, San Bernardino, and Riverside with top notch eye care services. If you are looking for a Fontana eye doctor who cares, look no further. We offer a variety of services at our offices so you receive all the care you need within one office. From frames to contacts, exams to eye surgery, our skilled and experienced eye doctors have your sight covered. Our Ophthalmology services include treating and curing specific eye problems with a specialist's hand. At our clinic, you will find ophthalmology and basic eye care services ranging from specialty care when needed to comprehensive exams and “basic” care. We provide contact lens exams, comprehensive eye exams, visual therapy, eye surgery and aftercare, sports vision therapy, computer vision treatment, and even designer sunglasses. Our clinic provides a broad range of care because we have the best doctors in their fields in house to make sure each patient is treated the same at every location. You will find that we can meet all of your eye care needs. We treat myopia, hyperopia, presbyopia, and astigmatism with contact lenses, glasses, or corrective surgery. 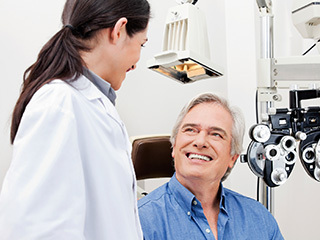 We treat eye diseases like glaucoma, cataracts, macular degeneration, diabetic retinopathy, and much more. If you do not have vision problems or eye disease, but still deal with discomfort in the eye area from eye allergies, conjunctivitis, computer vision, dry eye, or eye trauma we can aid you in improving your eye health and comfort. We even offer sports vision training to bring your performance on the field to the next level. If you are in need of your next eye exam then call us at Macias Eye Medical Centers we offer quality ophthalmology services to the communities of San Bernardino, Riverside, Fontana, San Bernardino, and Riverside. Eye care is vital because many degenerative conditions and causes of sight loss can be halted with treatment. Call us at any of our convenient locations to set up your appointment, Riverside (951) 359-0500, San Bernardino eye doctors (909) 885-3933, or Fontana eye doctors (909) 427-8900.